The Criel Mound, also known as the South Charleston Mound, is located along MacCorkle Avenue in central South Charleston, West Virginia, in Kanawha County. The mound is the second largest Adena mound in West Virginia and is believed to have been developed between 250 and 150 B.C. Some evidence suggests the site was used by Native Americans as late as 1650. 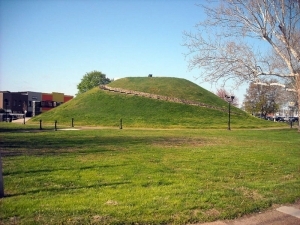 The Criel Mound was originally one of 50 mounds and prehistoric earthworks that extended from present-day Charleston, West Virginia, to near Institute. Most were destroyed during the industrialization of the Kanawha Valley, which followed the completion of the Chesapeake & Ohio Railway in 1872. The nearby Sunset Mound and the Dunbar Mound at Shawnee Park in Dunbar, West Virginia, also survive. The South Charleston Mound was significantly altered in the late 1800s when a race track for horses was built around its base. Its top was the flattened to accommodate a podium for race judges. The mound originally measured about 175 feet in diameter and 35 feet in height. It is now approximately 140 feet in diameter and 25 feet in height. At a depth of 31 feet, numerous other skeletons were found, including a burial vault with the remains of eleven persons believed to an Adena leader and ten of his servants. Numerous artifacts, including various jewelry and weapons, were found during the excavation.